Another Saturday card making session with my Granddaughter KK. We spent our day working on cards for the one year old baby's birthday party taking place later that day. We were extremely excited to have gotten the TGF Ever After Stamp Kit ( a pre-ordered stamp set offered by TGF ) earlier in the week. We had a blast stamping up the full set of royal princesses and princes. Trying to decide which ones to start coloring was a slight challenge. LOL. Our day went by so quickly while we were crafting away on this Ever After Stamp Set. 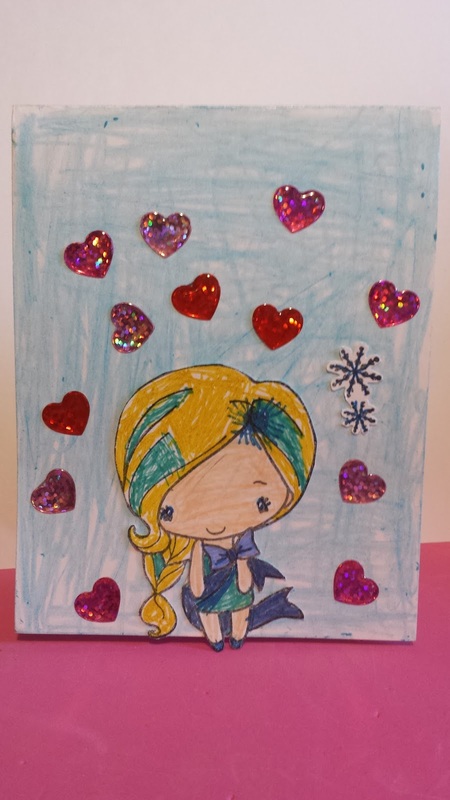 She colored in the snowy background with blue crayon, then colored in the TGF Holiday Anya 2 with glitter colored gel pens and some areas like the face with color pencil. 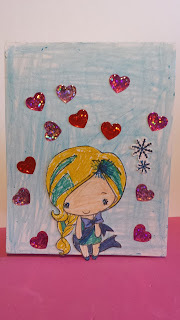 She used a blue glitter gel pen for the stamped snow flakes that come with the Holiday Anya stamp. 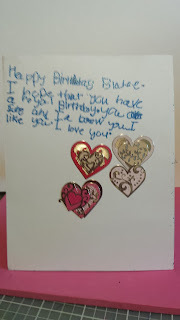 To put the finishing touches on her card, she decided to add sparkly hearts from Grandma's Valentine Stash container. For the inside of her card she used her Kindergarten skills to write a personal note to the birthday girl who was turning one year old, along with adding some more of the valentine goodies she found in my stash. As for my birthday card creation, I struggled with a bit of creativity block and the attempt of deciding on a card layout. 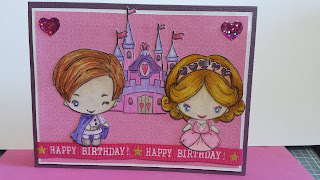 I finally decided to do a royal picture mural type card so I could use the adorable castle stamp with the royal couple I chose from the TGF Ever After Stamp Kit. Crafting with my Granddaughter KK can be rather crazy and filled with humorous things. I love family time and enjoy every moment of it and will cherish it forever. So in this crafting session, she was filled with helpful hints for my crafting projects. So, here is several brief examples...... While I was coloring my castle, and the royal couple, I had comments coming my way from KK was critiquing my work. She insisted on the princess having lipstick. I wasn't going to do it on this card, but she kept on insisting so, "Ok, I will do it just this once". 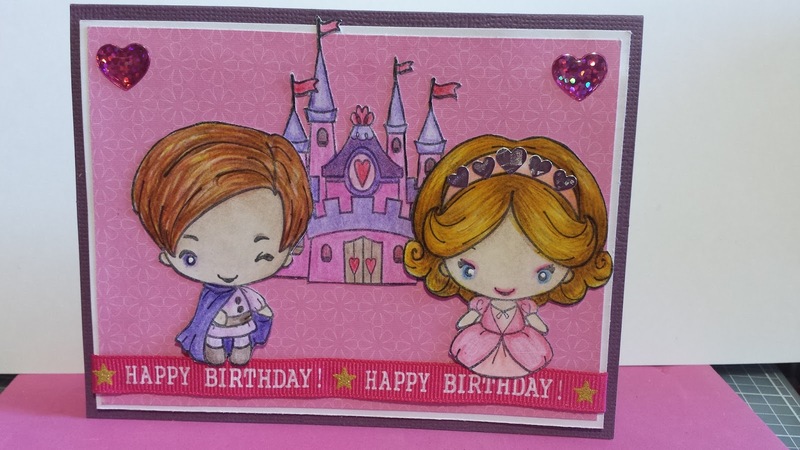 Then while I was laying out the couple and castle onto some design paper and cardstock, along with some cute Happy Birthday ribbon I had within my stash.... KK said I needed more on my boring card. She wanted me to add some bling and huge hearts onto the card..... I settled for slightly smaller shiny hearts for the corners, and then a slightly smaller set as well as for her headband. I finally got the approval on my finishing touches of the card. 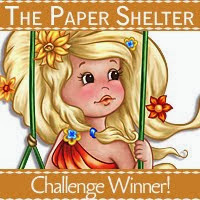 So here is my card creation I put together with the helpful advise from my 5 year old granddaughter. The TGF Ever After royal couple and the castle were colored with colored pencils. The finishing touches of hearts were from two different Recollections series of hearts. The Happy Birthday ribbon is from my stash and I do not recall from where I purchased it from. 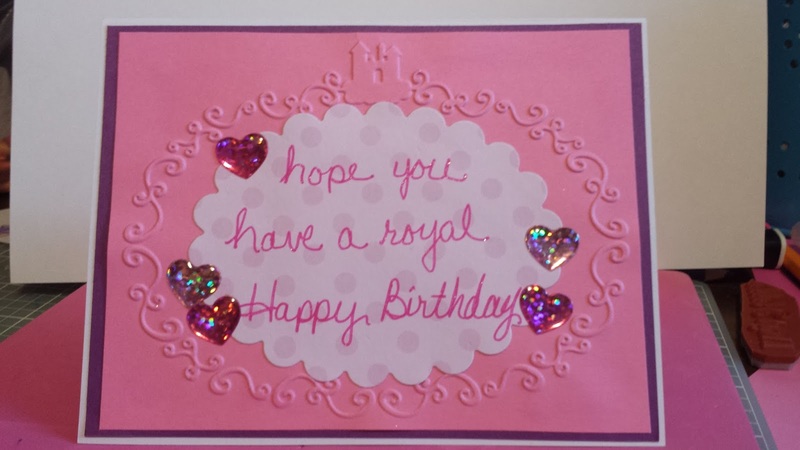 The inside of the card was done up with the same shiny hearts used on front of card. I used a Disney Castle frame design to frame the sentiment greeting. For the sentiment, I attempted to copy the handwriting used on a Recollection stamp set. I did not have a matching ink nor embossing powder for using stamped sentiment, but I did have a close matching color of a sparkly gel pen.....so below is my lame attempt to copy the handwriting of the stamp. Later, after I had finished and assembled the card is when the thoughts of 3rd or 4th generation stamping may have been the best solution to a great looking sentiment. 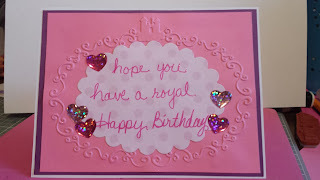 Here is my sad attempt to copy the writing of my stamps from the Recollections stamp set of birthday sentiments. So, here is our latest creations of our crafting session spent together. Thank you for taking the time to stop in to view the latest blog posting of our latest creations.